Racing History: Heather jumped into triathlon racing 10 years ago after relocating to Colorado from West Virgina. Being a collegiate-level swimmer, triathlons gave Heather a chance to rekindle her relationship with racing. She started in the Olympic-distance events, even up to a half-Ironman. Kids required her to back off to sprint-distance tri's, but is looking to get back into longer distance events, and increase her entries per year. Carmen started cycling by riding the TransAmerican/Western Express routes across the USA for Multiple Sclerosis in 2010 and joined the racing scene here in Colorado last year. Racing History: Sam has been cycling for nearly 20 years, starting with mountain biking and moving into road cycling a few years in. He loves the racing aspects of the sport - technical skills and racing tactics that come with criteriums, road racing and rugged mountain biking. Sam is toying with the thought of cyclocross for 2016, as well as focusing on a top-10 finishes in road and mountain racing. Racing History: Michael got into cycling almost 8 years ago, while living in Asheville, NC. After moving to Colorado, he joined up with others for group rides. His first criterium ended with a visit to the emergency room for a shattered collarbone and torn rotator cuff. Two surgeries and a year later, Michael hopped into his first triahlon - the Steamboat Lake Sprint - which hurt like nothing I've ever experienced - like an elephant sitting on his chest (in a good way). He was hooked. The Boulder 70.3 Ironman event and Leadville 100 MTB are on the calendar for this upcoming season. Professional: Michael works remotely for a tech company based in Santa Monica, CA, as a senior designer. Other: Two kids - a 7-1/2 year old son and 5 year old daughter, keep him busy. The son completed his first triathlon in 2015. His better half is originally from Fort Collins. The family enjoys heading into the hills for skiing in the winter. Michael enjoys a good scotch, and cheers for the Patriots on Sundays. 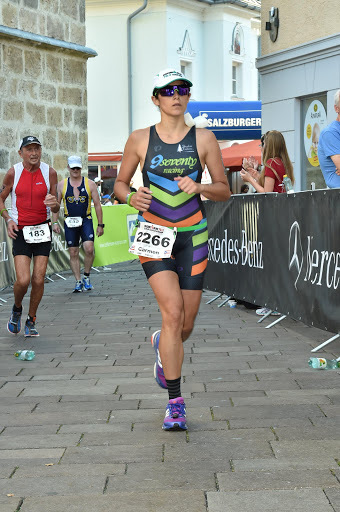 Racing History: In 2015, after becoming restless with the gym rat lifestyle, the idea of triathlons crossed her mind. She's now hooked and enjoys seeing how far she can push herself. Amy is planning for Olympic-distance tri's and possibly a half-marathon.